Our garage plans include many sizes and styles to suit your particular needs. Whether you need extra storage for yard equipment, or you want a workshop space for hobbies, these garage designs offer a place for keeping vehicles with many garage blueprints featuring other great features. Help increase the value of your home by adding a garage to your yard, while also keeping your cars in good condition and out of the elements. 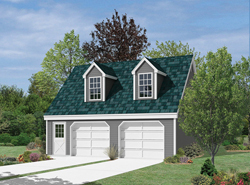 From simple 1-car garage plans to garage apartments, our garage plans has everything you need. 448 Sq. Ft., Width 20'-0", Depth 24'-0"
672 Sq. Ft., Width 28'-0", Depth 24'-0"
384 Sq. Ft., Width 16'-0", Depth 24'-0"
576 Sq. Ft., Width 24'-0", Depth 24'-0"
535 Sq. Ft., Width 28'-0", Depth 24'-0"
475 Sq. Ft., Width 36'-0", Depth 24'-0"
See other projects to construct, including easy-to-follow blueprint for indoor projects, sheds, decks and gazebos, backyard building designs, and other building construction ideas for your home.